It truly is this colour. I didn't enhance the photo. Golden deliciousness. 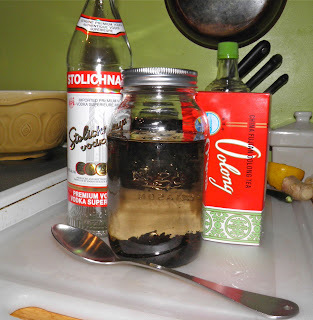 Ever on the outlook for the unusual, I recently stumbled upon several sites that offered booze recipes using tea leaves to infuse vodka. They sounded very interesting. According to the (many) sources, one can use black, oolong or green tea leaves, or any other kind for that matter. Each will render a result as distinctly different as the teas themselves, one would assume. One of my favourites is Oolong which is a partially fermented tea. 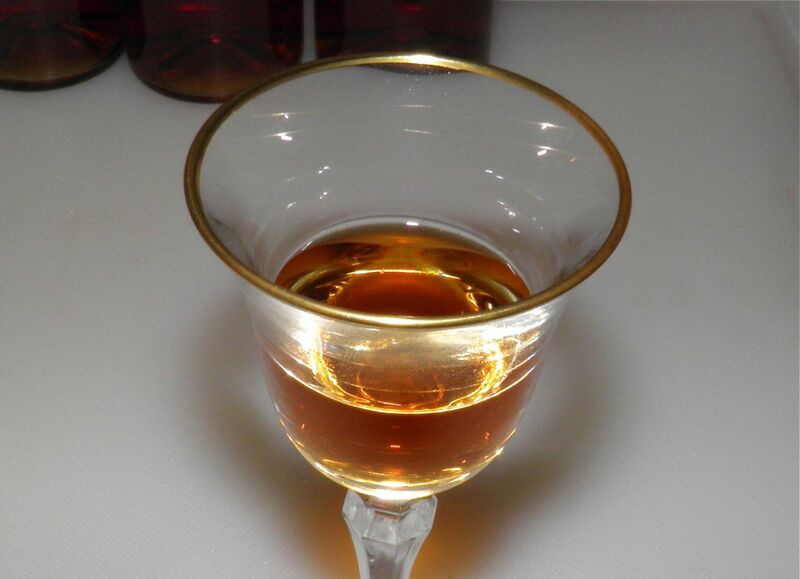 Chinese Oolong lends an amazing complexity and depth of flavour to vodka. When made with good quality tea leaves, all tea-infused vodkas need no sweeteners or mixers. I used Fujian Oolong leaves, purchased from our local Asian grocery, and my vodka came out a very nice golden “tea” colour. It started out an uninspiring off-white, but that changed quickly. 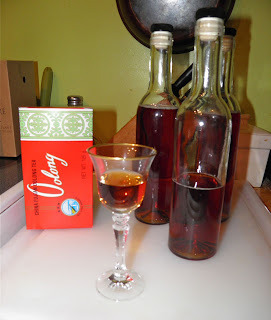 After my 24 hour "steeping" I finished the vodka as liqueur and it is truly wonderful. The nose is of tea and the taste is slightly sweet. After that the finish is warm from the alcohol. It’s quite…endearing. This liqueur may very well be one of my favourites. And the recipe is simplicity itself. This infused vodka can have many uses. Serve straight up chilled, or mix it with the simple syrup for tea liqueur. Either is great in more complex cocktails. I bet you could even cook with it. So grab your bottle of Stoli, Edina – and let's make some tea! Steep the leaves in room temperature vodka for 24 hours in a Mason jar. If you steep it any longer you run the risk of making the liqueur bitter, much like when tea is left too long on the stove. Shake the container every so often as you walk by. Strain out the leaves and chill. Serve as you would vodka. If making the vodka into liqueur, bring the sugar and water to a boil in a small saucepan. Let boil for 5 minutes. Allow the syrup to cool before adding to the flavoured vodka. Stir well and decant into bottles. Here’s a few drinks in which you could use either the vodka or liqueur. Just remember if using the liqueur your drink will be slightly less alcoholic.